This news may come as a shock to you. Up until yesterday – state transportation agencies weren’t required by the Federal Highway Administration (FHWA) to set goals for reducing bike and ped fatalities. They also didn’t have to track their progress either. This all changes now with a recent announcement from FHWA. State Department of Transportations (DOTs) will now be required to do both. Kudos to all the bike/ped advocates who pushed for the FHWA to adopt these new requirements. The League of American Bicyclists alone generated over 11,000 comments in support of adding the bike/ped performance measures. State DOTs won’t be penalized for poor performance but will have to still report out on their progress. Penalty or no penalty – FHWA’s new policy is a start for improving accountability and transparency around how state DOTs invest in people who walk and bike. Read the full story below from StreetsBlog USA. In a win for bike and pedestrian safety, the Federal Highway Administration announced yesterday that it will require state transportation agencies to do something they have never had to do before: set goals to reduce bike and pedestrian fatalities, and track progress toward attaining those goals. The news is part of FHWA’s roll-out of several “performance measures” for state and regional transportation agencies. The system of metrics is supposed to make the agencies more accountable for the billions of dollars in federal transportation funds they receive every year. 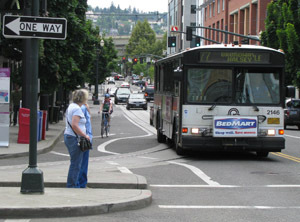 Advocates for walking and biking pressed FHWA to include bike and pedestrian safety measures in the performance standards, after they were initially excluded. Andy Clarke, former head of the League of American Bicyclists, now with the Toole Design Group, said the League helped solicit more than 11,000 comments in favor of creating performance measures for bike and pedestrian safety. FHWA must have been listening. In its announcement, the agency said, “Non-motorized safety is of particular concern and improving conditions and safety for bicycling and walking will help create an integrated, intermodal transportation system that provides travelers with real choices.” Translation: The feds value walking and biking. A report last week from the Governor’s Highway Safety Association found that pedestrians account for a growing share of total traffic fatalities in the U.S., a trend that didn’t get any better in 2015. “The performance measure makes sure non-motorized crashes actually count, and are counted and recorded in a way that will hold agencies accountable for addressing the issues they raise,” Clarke said. If the new reporting requirements make an impact, it will be thanks to increased transparency, not financial incentives. State DOTs will be required to track their performance on bike and pedestrian safety, but won’t be penalized in any way if their “performance” is lousy. However, they will be forced to report that lousy performance — which is a start.